Supergirl is making good on its commitment to tackle real-world issues through an alien lens this season, if “American Alien” is anything to go by. Meanwhile, Kara’s (Melissa Benoist) reporting gig plays a much smaller role, but it’s still more journalism than we’ve ever seen grace National City. Both sides of Supergirl’s life are attacked by the hatred and fear lurking in dark corners this week and, although the episode doesn’t do much to connect the disparate elements, the sincerity behind the new storylines garner a lot of good will. Kara is suddenly a mentor now! “American Alien” opens on a strong note that belies just how messy things will get by the end of the episode. After performing a flawless string of heroic feats all over the world, Supergirl transforms into ace reporter Kara Danvers just in time to ask the President a question at her press conference. This newfound confidence is a great look on Kara and helps underscore the time passing since last season’s Reign shenanigans, even though the audience knows that such peace can’t last. Still, it’s nice to see Kara at the top of her game both as a hero and a journalist. 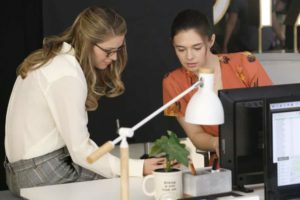 She even gets a cub reporter to mentor in Nia Nal (Nicole Maines, who acquits herself remarkably well in the limited screen time she’s given). Nia’s a Kara 2.0, and her optimism mixed with self-doubt seem to intentionally reflect Kara’s own struggles throughout the episode. That reflection, however, doesn’t transfer as well when it’s used on Kara in the A-plot of the episode. When faced with the possibility of hate crimes against aliens rising due to fairer legislation on their behalf – the metaphor is rather blunt, but still appreciated – Kara becomes the epitome of white feminism. It’s a bold move to have the protagonist embody the wrong perspective and have to learn from her mistake over the course of the episode, but her reaction to J’onn’s (David Harewood) warning felt a tad too harsh and defensive. It’s tough to believe that Kara wouldn’t investigate his claim of hate crimes simply because she preferred to believe the world was a better place based on how it treats her, especially when just two seasons ago she was dealing with rampant alien discrimination. Let’s not lie to our partners, guys. Nevertheless, Kara does eventually see the error of her ways when she learns that the Graves Siblings plan to attack Camp David during an Alien Summit. We don’t learn much about the newest villains in town, other than they used to work for the Luthors and are now spreading anti-alien sentiment under the orders of a mysterious figure named Agent Liberty, but they prove to be formidable foes throughout “American Alien.” Their final play of the night is to expose the President as an alien herself, which is a killer move that’s sure to make the public afraid and distrustful. If they and Agent Liberty maintain the same level of wits in the future, Supergirl will have another successful villain story on their hands. 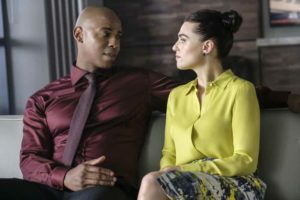 The B-plot revolved around how James (Mehcad Brooks) and Lena (Katie McGrath) were dealing his upcoming indictment for taking on the vigilante role of Guardian. While Lena’s willingness to get her hands dirty in order to keep her boyfriend jail-free revealed new and interesting sides to her character, and allowed for some tense and complex moments between mother and daughter, it’s not a good sign that the GuardianCorp relationship is kicking off the new season by keeping secrets from each other. James explicitly asked Lena not to get involved in trial proceedings, especially not through her family’s shady connections, yet the first thing she does is manipulate her mother into giving her information that she can use to get James case dropped. It’ll probably take awhile for James to figure out what happened, but the revelation will most likely lead to unnecessary drama that once again requires the audience to believe that the current incarnation of Lena would ever turn evil. Finally, Alex (Chyler Leigh) and Brainy (Jesse Rath) adjust to their new work situation at the DEO in what ends up being the best part of “American Alien.” The emptiness Alex feels over losing Winn to the future can only be matched by what Brainy feels over being left behind in the past, and so a humorous side plot about different work habits becomes a touching tale of two people adjusting to difficult circumstances. It helps that Leigh is one of the strongest actors on the show, and easily able to integrate both comedy and drama into any scene. All of these plots had their strong points, but they felt very disconnected from each other even as the characters discussed them in the same scene. That sense of separation was only highlighted by the final moments of “American Alien,” in which the new Kasnian Supergirl is shown punching a hole underground – right below the train that the American Supergirl saved earlier. Obviously the audience is meant to draw a connection, but the meaning of said correlation is totally unclear. Is she related to the Graves Siblings, or is this a situation that will emerge only after the first one is resolved? Find out when Supergirl airs next Sunday at 8/7c on the CW.